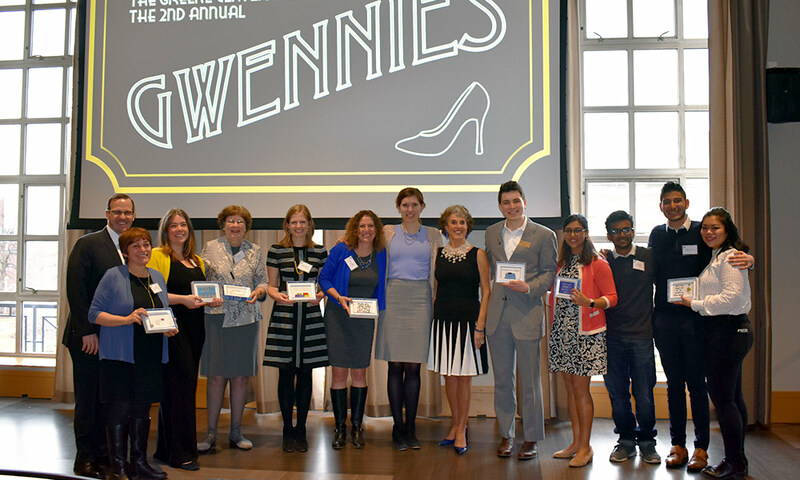 BME senior Anisha Khosla recently received a Gwennie award from the Gwen M. Greene Center for Career Education and Connections. The award honors partners who exemplify the Greene Center’s values—respect, collaboration, diversity and inclusion, betterment, and purpose. “It’s a celebration of our colleagues and partnerships across campus,” said Joe Testani, assistant dean and director of the Greene Center. “Without them, we wouldn’t be able to fulfill our mission." Gwen Greene ’65, the longstanding Board of Trustees member for whom the center is named, presented the awards and spoke of the passion that fills the center. “By working together, there’s nothing we can’t do,” she said. University president Richard Feldman was the luncheon’s final speaker. “When you think of the range of people nominated for these awards, it’s a really remarkable testament to the growth, and expansion and kinds of partnerships that have been built,” Feldman said. “This is the University of Rochester at its best.” Read more here.